The Company of Animals High Frequency Dog Whistle is a lightweight and compact whistle ideal for dog training, both indoors and out. 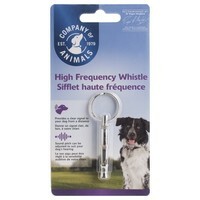 The High Frequency Whistle is particularly appropriate for noise-sensitive breeds such as border collies. It should be noted that the whistle is just audible to the human ear, essential for gauging it's efficiency. I know this is cheap but the least I expected of it was that it was a silent whistle, its not in fact its particularly loud, I would advise VetUK to even stop selling this as it is not as advertised.